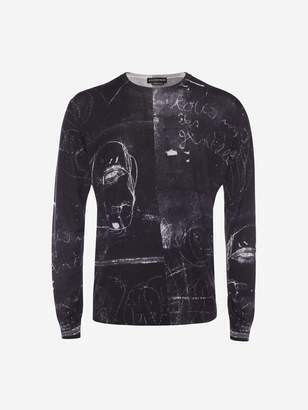 Black fine wool silk crew-neck jumper with a printed John Deakin Archive* sketch motif. The jumper has a ribbed crew-neck, cuffs and hem. *Prints provided by The John Deakin Archive Material 70% Wool, 30% Silk Product code 560549Q1RRY1069 The model is a standard IT 46 Model measurements Height: 188 cm/ 6â€™2'' Chest: 88 cm/34" Waist: 71 cm/27"